Life is busy for most (dare I say ALL) of us. And now, as November 1 and the beginning of NaNoWriMo loom in front of me, I find myself fretting about whether I should even consider participating in it (even though I know I’m ultimately going to do so). So, as I’ve done now every late October since 2006, I feel it’s time to think about how to squeeze just a little more time out of my day so that I can write. There are days, weeks and months where I can’t even stand the thought of trying to find an hour or two to put pen to paper. Between the day job and it’s attempts to steal my soul, the kids and their busy social, sports and school schedules, the yard work, the housework and the occasional need to eat and/or sleep, there’s hardly any time left to stop and drink the coffee, let alone do anything else. Every day is a delicate balancing act—a minute-by-minute attempt to do all the things I have to do while also saving some time for the things I want to do. As a writer, I’ve struggled to find that balance for years now. Partly it is because of the sheer volume of things I’m required to do; partly it’s because of the large number of things I want to do. What this has netted out to for me is a severe lack of writing time because I cannot find ways to prioritize writing over other demands. Yet, I see other authors I admire putting pen to paper and churning out fantastic stories each week, including some terrific works in response to our Write Now prompts. I often wonder how other people have managed to balance their time and put a priority on writing when they have at least as much going on as I do. I’ve tried forcing myself to write when I’m too tired or too stressed to do it willingly, but all this has done is make the writing unenjoyable – just another chore I am angry for having to do – and ultimately it is just as stressful as anything else I might have on my to-do list. I don’t know about anyone else, but when I resent the time I spend writing, the bitterness and anger shows through in the words that get onto the page. While I might use this negativity to my advantage when I am writing performance reviews at work, it is not usually something I want coming through in my fiction. I do not know exactly where all the hours go. I’ve spent a fair bit of time pondering these two seemingly-simple items and I’ve determined that there is nothing I can do to resolve the there-is-not-enough-time-in-the-day conundrum – thus far, I have found no practical, sustainable and environmentally-friendly way to increase the available pool of hours per day beyond the current arbitrary limit of 24. So I’ve set my mind to working on the second item. To approach this issue, I have started keeping a chart of how I spend my time. As anyone who knows me might expect, I am using Microsoft Excel to keep track of this data because that’s the kind of geek I am. Basically, I’ve been attempting to put together a general list of what I do each day, from the mundane “go to the gym” or “drive The Boy to baseball practice” to the more broad-based “hours spent on the day job”. My goal, of course, is to find a few hours per week to dedicate to writing without taking away even more time from tasks I hate but must do anyway (sleep, for example). I spend at least an hour per day (on average) driving the kids to and from events. I spend 9 to 12 hours per day on the day job. On average, 1 to 2 hours per day is spent on household chores such as laundry, dishes, pet care, etc. I spend, on average, less than 1 hour per week dedicated to writing. There are, on average, 2 hours per day that I can’t reasonably account for. Looking at the above items, it is clear why I’m not getting enough writing done – less than one hour per week is not enough time! It would be easy to say “well, just cut the television time and write instead.” But the problem is that I am a daylight-hours kind of person. Once the sun goes down, I am essentially a useless excuse for a human being and it takes an exorbitant amount of effort to do anything that takes thought. I only watch television at night because it takes little-to-no mental activity to do so. The bit that bothers me, though, is the 2 hours I can’t account for – just like when you’re tracking money, anything you can’t account for is bad. Clearly, this analysis is nothing more than a tiny, first step toward conquering this problem by starting to understand what is going on in my day. My plan of attack is to find those two missing hours and beat them into submission. My second step will be to re-arrange the tasks and order them such that mindless activities, such as dishes and laundry, can be put into the evening hours. Ultimately, I hope to end up with a block of time each day which falls during hours when the sun is still up. That block, I hope, can be devoted to writing. I am very interested in how other writers find ways to balance their need for sleep, food and family with their need or desire to write. Do you schedule time to write? Do you budget your time like I’m describing? Do you have other tricks or tips? This entry was posted in News and Updates and tagged balance, life, schedules, time, work, writing. Bookmark the permalink. Good question – I would also love to hear how other writers do it. I have an editing project in front of me that isn’t going anywhere until I strap myself down to it…hope you get the tips you need. Oh, I am totally hoping for tips and such but mostly I’m hoping to help folks who are wondering how they could ever find the time to do this – with “this” being writing at all, NaNoWriMo, or other things. This little exercise of tracking what I do each day shows me that there are inefficiencies and wasted time that I could, perhaps, streamline to become more efficient. Perhaps it’s true for someone else, too. Rob, I like the way you’ve analyzed your daily activities. I bet the lost 2 hours have something to do with the computer – emails, Googling, etc. Maybe exercising, shopping, reading, or being with friends. 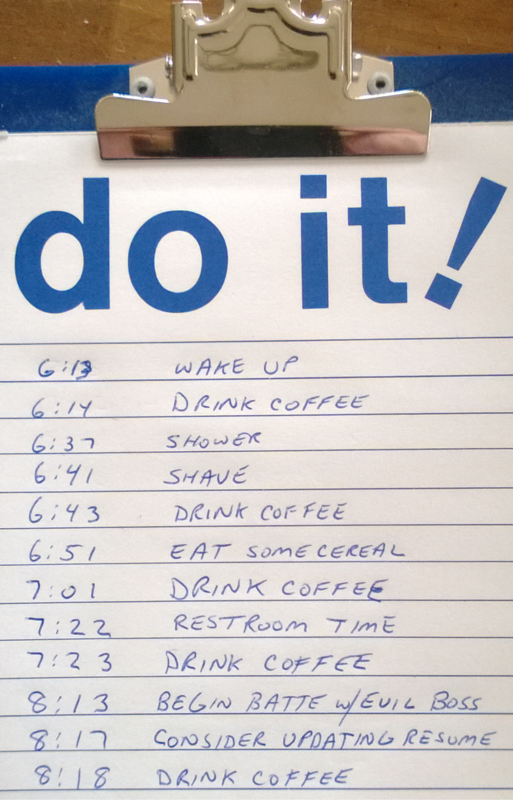 I might try to track my daily routine, just to see where I’m wasting time. I think you’re being tough on yourself. Maybe concentrate on that one hour of assigned writing time and just enjoy it. Yeah, I tried to capture those activities, too. But it could just be that it’s the time I spend walking/driving in circles while moving from one task to the next. Those minutes certainly do add up. And totally I am hard on myself. Been that way since I was a kid (started probably around when I was 8 years old which is when I made some decisions about how life was going to need to proceed for me). I now see it as somewhat of a flaw, but it’s so entrenched in me that I can’t see it changing all that easily. Can say that I personally ended up scheduling time for writing after finding out that I actually can perfectly fit ~1.5 hours of piano practice into every evening. A little app like TimeTune or Write-o-Meter (both Android) which would play a reminder sound at a particular time – and there you go. When I have no desire to write, I still sit down at the set time and do something around my current project. Character sketches, streamlining timeline, simply writing down the detailed description of the plot if the project is new and all such stuff. It usually helps to get in the mood. I start to think about the plot and the characters, and it makes it easier to actually write the next evening. Or even on the same evening before I go to bed (that’s what those “emergency” 15 minutes are for). I long since realised that waiting for time to magically make itself available is a dead end. Scheduling helps me to kind of justify why I have to sit down and do some writing. I used to get to work early and spend an hour or so writing before anyone else got to the office. But I’ve been working from home for the past 5 years so there isn’t really a “getting to work early” anymore, since I’m pretty much always at work. It’s one of the few downsides to working at home. That is a frightening schedule. If you quit your day job, it would free up an awful lot of writing time. Just sayin’. It sure would free up a lot of time for writing…. I don’t know how you manage. If I spent less than 5.5 hours a day sleeping, I would definitely spend the remaining 18.5 hours a day walking into walls, tumbling down stairs and accidentally stabbing myself at mealtimes with my fork. I used to not be bothered at all by the less-than-optimal sleep totals but these days it’s starting to be harder for me. It is totally part of the problem I have with writing these days and it didn’t used to be a problem. I am not going to claim I do it right, but I’ve managed to carve out Sunday afternoons as my time to write. I am lucky that it’s only my wife and I at home so the demands on my time are a little less. Still I often find I have to protect that writing time by letting people that writing and being creative is a priority in my life. It’s not easy and sometimes I don’t make it.